Here, strategically placed in one of Mick Wallace's restaurants, is a poster for the recent Dublin launch of Let Us Rise! The Dublin Lockout - its impact and legacy. The book has a foreword by Joe Higgins T.D. 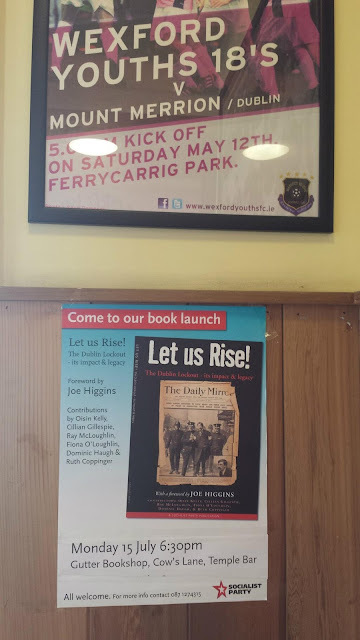 and is published by the Socialist Party with contributions from Oisín Kelly, Cillian Gillespie, Ray McLoughlin, Fiona O'Loughlin, Dominic Haugh & Councillor Ruth Coppinger. I will be reviewing Let Us Rise! for the September Biblio book review page in The Galway Advertiser and attended the Galway launch at Charlie Byrne's bookshop last Friday week. The process of obtaining a review copy was, well, circuitous. All going well, the review should appear on Thursday, September 5th.